Annales de Recherches Vétérinaires was created in 1970. 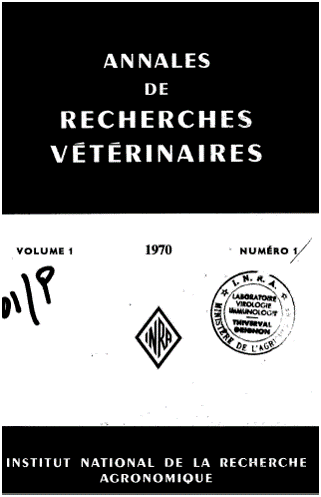 In 1993, Annales de Recherches Vétérinaires began Veterinary Research (see archives of Veterinary Research). The journal was edited by INRA Editions until 1989. In 1989, it started being published by Elsevier and from 2000 to 2010, the journal has been published by EDP Sciences. Since January 2011, Veterinary Research is an open access journal published by BioMed Central www.veterinaryresearch.org. Veterinary Research is supported by the Animal Health Division of the French National Institute for Agricultural Research (INRA).